• Sheherazade – Youko just started working as an office lady at a new company. According to the gossip, Shinogami, her boss, is cursed and any girl who gets involved with him will die. After a lively welcome party, a drunken Youko wakes up in Shinogami’s bed. What will become of her? • Sheet no Sukima (Between the Sheets) – Momoko and Kazuya go to apply for a marriage registration form, but the man at the public office, Hisame, is so rude that he offers them a divorce registration form as well. One month later, Momoko returns and…? • Yoru no Bannin (Night Guard) – Maya consistently stays late at night at the office to finish her work, which earns her a nickname from the security guards. One guard in particular won’t allow her to stay despite her cries of saying that she’ll be done in 5 minutes. However, he notices that she’s been getting thinner and decides to make her lunch?! What exactly is going on? 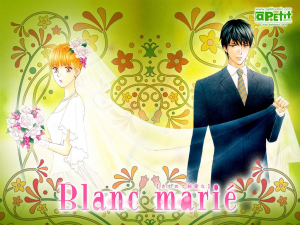 • Blanc – A girl is getting married soon and goes to visit her cousin that she grew up with. However they’re closer than just family. • Kizuato – Woman whose husband was killed in a car accident sexually abuses her handsome servant. • Izayoi (16-Day-Old Moon) – Tsukiko is driven to suicide, while Akito tries to keep her away from her doctor. But what is Akito’s relationship between Tsukiko and the doctor; what is the doctor’s real identity and who exactly is Akito? # Summary: What’s more painful than being married to a faithless and irresponsible husband? Being in love with your own brother-in-law, that’s what!